So the pile of woodchips is reaching epic proportions. Not quite, but I suppose that's what you get trying to mill a couple 8" wide 8/4 boards. 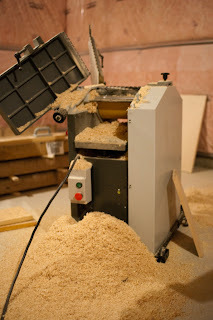 Of course, I am now forbidden by order of the spouse from milling until I get the dust collector up and running. Minor dilemma of whether to put it on a separate circuit or not. I wouldn't think the circuit would trip with one of the machines and the dust collector running, but I guess better safe than sorry. Back to milling. I'm not able to get the board edge jointed at 90° to the face. It's off by maybe 0.5°. The fence and the feed/outfeed tables are definitely at 90° so that leaves the cutter head as the only suspect in the misaligned cuts. Well, the cutter head and my technique.